In a large bowl, whisk together the tamari, vinegar, sesame oil, garlic, honey and sriracha. Add the cabbage, pepper and scallions; toss to combine. Meanwhile, bring a large pot of water to boil. Cook the soba noodles according to package directions and rinse under cold water. Add to the cabbage mixture and gently toss. 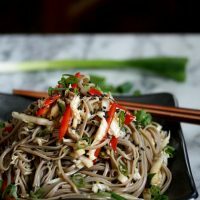 Transfer the cold sesame soba noodle salad to a serving plate and garnish with sesame seeds, if using.